But just how realistic are some of those headlines? Are they nothing more than wishful thinking on the part of (God forbid) the unwashed hippie. Or did they originate from seasoned economical professionals, experienced farmers, long time retailers, and others? In other words, people who know what they are talking about. This probably being the first report dealing with the subject, has sought to “OBJECTIVELY” examine the financial issues, using (whenever possible) real-world statistics to reach its concussions. However, in doing so, we’ve run headlong into some real world problems. All of them related to objectivity when dealing with a very emotional situation. Yes, yes, our veterans coming home from the wars are suffering from P.T.S.D. Cancer victims are undergoing the weakening effects of chemotherapy. Far too many patients are suffering from seizures, and an endless list of further ailments. Medical Cannabis has been scientifically proven time and again to be medically useful for these ailments, and so many more. Rest assured that no one is trying to act like a ghoul, and undoubtedly one’s heart does go out to many of these medical victims. However, this report, by definition, deals SOLELY with the financial impact that full re-legalization of medical marijuana would bring, specifically, as regards to tax revenues and expenses to Oklahoma governmental agencies. As many are profoundly aware, Oklahoma is one of the most “NON-TRANSPARENT” States in the Union. Simply put, there is either a total disregard for public data, or a complete conspiracy to keep it secret, or perhaps even both. A good example of this is provided by our “Department of Corrections”. In order to calculate the costs of marijuana incarceration, we need to know the exact number of prisoners doing time for marijuana related convictions. However, the Department of Corrections claims that it doesn’t know how many of its inmates are doing time for Marijuana. How this can be possible is beyond the imagination. Be that as it may, the fact that the Department of Corrections doesn’t know (or claim they don’t know) the number of prisoners with marijuana related offences would normally have prevented the calculation of prison expenses for just that. Fortunately, as the result of a previous report, a copy of the prison data (via Oklahoma’s Open Records Act) had been obtained and an elaborate (as closed to a physical head count as possible) had previously been done. $23,000 = costs to maintain incarceration of each prisoner for one year. This is per State Representative Bobby Cleveland who is on the prison commission. However, while this report was able to obtain these specific figures, it was not able to obtain all the statistical data needed for this report. For example, if you listen to those running the Foster Care system, no child is being taken away from their parents because of Medical Marijuana use. However, according to all we see around us, that answer simply isn’t correct. In fact, children ARE being taken away from Marijuana using parents, even if an established medical use is clearly present. However, referencing the previously mentioned “Ghoul Factor”, this report interests itself solely in the financial, not the moral issues involved. But how does one go about establishing exact figures when the data needed is unavailable? Obviously, one can’t and in these cases some amount of technical guess-timents (which are labeled as such) had to be made. Yet in other cases we’ve been forced to simply make note of the facts and declare it an “unknown” figure, to either be added or subtracted from the totals. And to that we should add, “…even when the facts (at least at first) make no sense.” For example, let’s look at the following two headlines. At first, one may be confused. How can both statements be true? However after a more careful reading, you would recognize that one statement makes reference SOLELY to recreational Marihuana sales, while the other makes references to all forms of tax increases, including Industrial Hemp growth, recreational sales, the tourist industry, etc. At the present time (2017), Oklahoma is facing state budget deficit of between a Half to almost One Billion Dollars for the coming year. 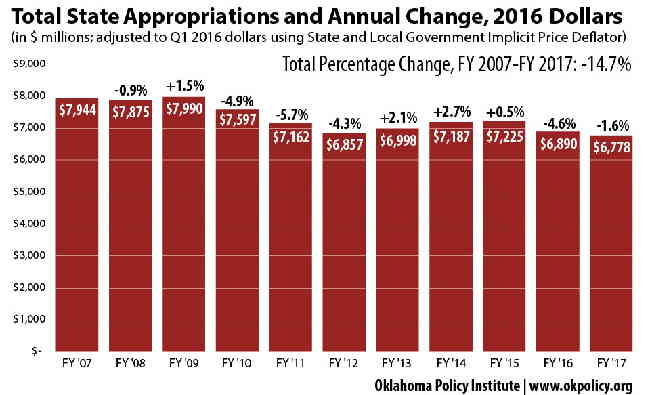 Which as can be seen from the table below (the entire 2016 budget was only $6.9Billion) meaning that by Oklahoma standards, this is indeed quite a deficit. And indeed there is some truth to that expression. As experience has shown here, once a tax is put on the books (no matter how temporary it’s claimed to be), very seldom does it ever go away. And it can safely be assumed that this is something of which the Oklahoman voters are all too well aware. Or putting it another way, over here you couldn’t get elected dog catcher if it were known that you supported higher taxes. Thus, the state must look to other sources of revenues. Specifically by growing the economy, as opposed to finding news ways of taxing our existing one. Oklahoma, for good or bad, is economically over-reliant on the Oil Industry. When the Industry is up, tax revenues flow into the state coffers, lots of well paying jobs are created, lots of sales tax revenues flowed into local municipalities, etc. But when the industry is down that revenue stream sort of shuts down. Which is the situation we now (2017) find ourselves in today. And while much blame can be placed on past policies that have made us over-reliant on one industry, why didn’t we diversify ourselves while we had the chance? At this point, there is no sense in crying over spilled milk. Simply put, the price of oil has dropped by more than half over the past few years, and has yet to recover. Create a new multi-billion dollar a year industry. Create thousands high paying jobs (Farming, Hemp Mills, Transportation, Business Travel, etc. ), that previously did not exist. Assist our farmers (and even ranchers) by providing them with an alternative high profit crop. And best of all, have the residual effect of keeping lots and lots of money, now being channeled into Colorado, right here at home. And grant it, while there are other avenues that we could and should also be taking to diversify our economy, legalization of marijuana is a simple, very logical and very cost-effective method of doing so. One requiring NO TAXPAYER MONEY, NO NEW TAX INCREASES and best of all can be done literally almost overnight. Simply, put, it’s a win, win for the taxpayers, for the economy and for the future of Oklahoma. Most people, regardless of political or personal stance on the matter, no longer believe that marijuana’s full legalization is still an IF, AS OPPOSED TO A WHEN. This report seeks therefore not to argue re-legalization, but solely to document, the financial impacts (both negative and positive) that legalization will have on Oklahoma’s taxpayers. However, it would be negligence on our part not to at least mention the obvious: That there are those who are dead set against re-legalization - NO MATTER WHAT. Or more correctly stated; For every tax dollar lost due to legalization, the state treasury will actually gain ninety-nine dollars.